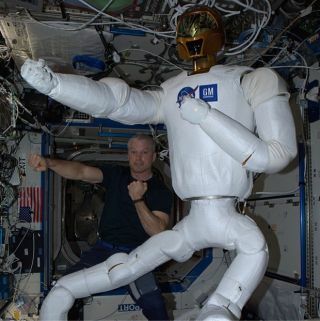 NASA astronaut Steve Swanson poses with the robot Robonaut 2 on the International Space Station after completing an upgrade that gave the robot legs. NASA's robotic space station crewmember could head down to Earth as early as May for repairs. Robonaut 2 will hitch a ride on a Dragon spacecraft as a part of SpaceX's 14th commercial resupply mission, which is set to launch to the International Space Station no earlier than April 2 and is slated to return to Earth a month later, NASA officials said. "They will also do some refurbishment, and then plan to send it back up — I believe they have funding to send it back up and then continue the investigation," he added. Johnson Space Center officials have said Robonaut operated well on the space station until 2014, when astronauts added a pair of legs to increase the robot's mobility. But the robot wasn't designed to be serviced by astronauts, and the installation proved challenging; afterward, the legs wouldn't move once the motor was fully powered up, and several other errors manifested in its operation. Robonaut will ride with science samples from biology, plants and protein crystal growth, cell research and human research experiments, as well as hardware from experiments that have been completed, including a computing experiment and an Earth-observation experiment, Hasbrook said during the news conference. The Dragon spacecraft, set to launch in April and return in May, has already been to space; the spacecraft was first used on SpaceX's eighth resupply mission to the space station. The first-stage booster that will lift it off Earth was also used before, this one on SpaceX's 12th resupply mission, NASA officials said. Email Sarah Lewin at slewin@space.com or follow her @SarahExplains. Follow us @Spacedotcom, Facebook and Google+. Original article o Space.com.